Tendons (connective tissue between muscle and bone) transmit the forces of muscles to the bones in order to create movement. As a result, tendons undergo repeated mechanical stress, which can lead to tendonitis if the tendon becomes over-stressed. Tendonitis is the inflammation of a tendon where it connects to the bone. This is typically due to overuse, increased stress associated with muscle spasm, dysfunctional joint movement, muscular imbalances, or a combination of these factors. When the tendon is over-stressed, it becomes inflamed and painful in an attempt to force you to decrease its use and let it heal. Anti-inflammatory and pain medications decrease inflammation and block pain signals to the brain, but do not allow the tissue to heal, thus prolonging the damage being done to the tissue. These medications (especially ibuprofen) have also been shown to cause liver and GI conditions over time. Another pharmaceutical approach that is common in the treatment of tendonitis is cortisone injections. Scientific research has shown that while cortisone injections provide short-term pain relief, they actually produce poorer results in patients the following year compared to those who do not receive cortisone shots. Cortisone shots have also been shown to cause tendon rupture and loss of bone mineral density. 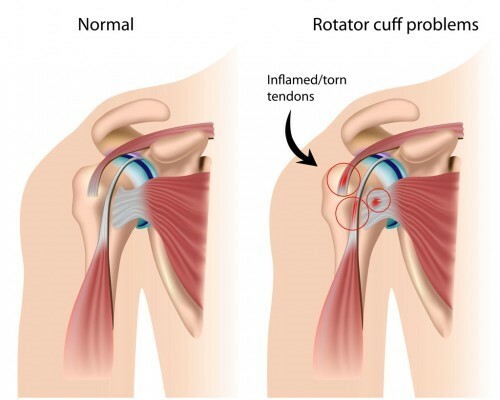 After a period of time, inflammation decreases as the tendon continues to degenerate if not allowed to heal properly. This is termed tendinosis, and at this stage it is not the inflammation that is causing the pain, but rather the damage to the tendon itself. This means that people with tendinosis are often taking side effect-producing, anti-inflammatory medications for a non-inflammatory condition. Tendinopathy is the process of tendon stress, inflammation, and degeneration. Chronic tendinopathy can lead to weakening of the tendon, possibly leading to tendon tear or rupture if not corrected. This is why our team at the Balanced Body Center works hard to correct this condition as quickly and efficiently as possible to relieve pain and prevent further damage. Temporarily decreasing use, using supportive tape/braces, naturally reducing inflammation (through chiropractic adjustments, supplementation, and soft tissue therapies), utilizing massage, and restoring proper function in the joint all need to be considered in order to allow the tendon to heal. It is important to utilize a variety of methods (including proper diet) in the treatment of tendinopathy as it is nearly impossible to completely avoid using the muscle associated with the involved tendon. Our patients find that this multifaceted approach quickly decreases their pain and, over time, eliminates this frustrating condition, even in the most severe cases.